BALDY CREEK – The next time you’re sitting in the bleachers at a Glenwood Springs High School football game, waiting for the kickoff, squint and imagine a field three times as long as the football field. There are goal posts at either end of the 300-yard field – but instead of 22 boys in pads and cleats, imagine eight galloping horses tearing up the turf, with men in the saddles swinging 50-inch mallets with bamboo handles and cigar-shaped hardwood heads. The sharp report as the mallets whack the willow ball echoes from the valley floor off the bluffs across the Roaring Fork. In fact, right where you sit in today’s football bleachers was once a polo field, club house, and race track – all created by early Glenwood entrepreneur Walter B. Devereux, who also built the Hotel Colorado. Indeed, the first polo tournament in Glenwood was the Devereux Cup, staged in 1893 as part of the opening celebration of the Hotel Colorado. Proper attire in those days was required not just on the field, but also among the spectators. Photos from the time show women in long skirts and hats, their gloved hands holding their husbands’ polo mallets as they pose. Other women stand outside the clubhouse with teacups balanced on saucers, gazing toward the action on the field. But for all the refinement in the stands, many of the polo players themselves were local cowboys, whose lives on horseback were perfect training for the sport.Glenwood’s polo tradition continued on Sunday, when the Hotel Colorado sponsored the 2007 Devereux Cup at the Stout Ranch on Baldy Creek in the hills south of New Castle. At higher than 8,000 feet, the polo field is on a mesa surrounded by the Garfield Creek State Wildlife Area with a switchback ascent to an awe-inspiring view of the mountains. The Rocky Mountain backdrop of the Stout Ranch recalls the rough and tumble Colorado cowboys who would play those early games, adapting Europe’s “sport of kings” to their own Western style. 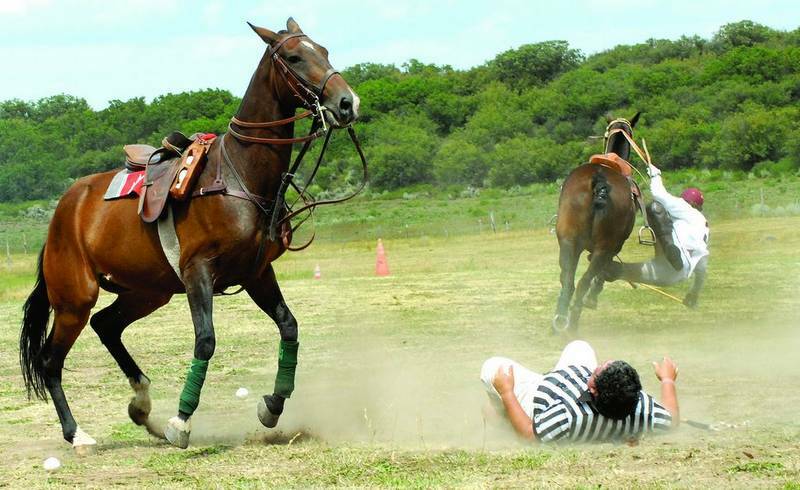 Unchanged is the demanding nature of the game, which requires stamina, courage and a high-level of horsemanship. Players battle for the ball, riding hip to hip at 30 miles an hour, standing up in the stirrups and leaning out to whack the ball at a full gallop. The demands on the ponies are intense as well; at the end of each seven-minute period – or chukker – the riders switch to a fresh set of mounts.In the opening match of this year’s three-team round-robin tourney, Team Azteca battled the Roaring Fork Polo Club. Roaring Fork took a 3-0 lead in the first chukker, on goals by Daran Brummond, Thomas Dunmire and Craig Huber.In the second chukker, Azteca came roaring back with George Estrada, Tom Powell and Michelle Huber each racking up a goal to tie the score at 3-all. Roaring Fork’s Lloyd Ryder put in a penalty shot from 60 yards, to put his team up 4-3. In the last seconds of the period Estrada stole the ball from Ryder and tipped in a goal to end the match in a 4-4 tie.Next up was the host team from Hotel Colorado, with Roaring Fork staying on the field. Roaring Fork’s Ryder knocked in the first goal as Hotel Colorado’s Barry Stout chased him down the field, both players racing flat-out. Hotel Colorado’s George Estrada III (whose father was playing on the opposing team) answered quickly, carrying the ball down the 300-yard field and knocking it through the uprights to tie the score at 1-all. In the second chukker, Stout made two 60-yard penalty shots to lead Hotel Colorado to a 3-1 victory. The day’s final match brought Team Azteca back on the field. A Hotel Colorado player tipped the ball out of the lineup, and a teammate, Todd Marion knocked the ball down the field, where Estrada III jumped on it. A hard ride-off by his father pushed Estrada III off the ball, but Stout came racing up from behind to make the goal. Then Stout made his third penalty shot of the day to end the chukker at 2-0. In the last and final chukker, Team Azteca was shut out as Stout scored one last time to give Hotel Colorado the 3-0 victory and the 2007 Devereux Cup title. Roaring Fork took second place in the tourney, with Team Azteca third.Linda Lafferty is a polo player and freelance writer.